My mum used to have a metal bread bin in the 1960s but it wasn't as pretty as this one! As well as looking good it's also a really good size as you can see below. That is a large loaf from the bread maker, so I recokon you could store couple of sliced loaves or one loaf and some rolls or other items like bagels or croissants in this bread bin. 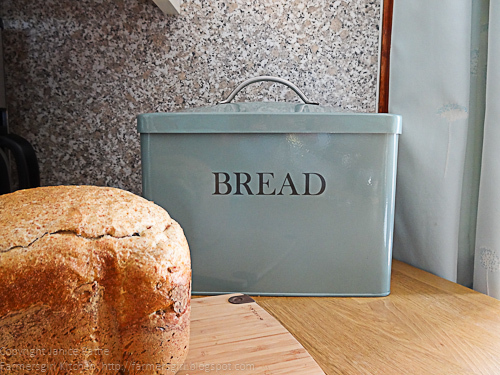 I was particularly attracted to this Shutter Blue bread bin from Garden Trading because it goes so well with my kitchen. Garden Trading have the same bread bin in Flint (soft grey), Clay (off white) and Slate (dark grey) so there is sure to be one which would go well in your kitchen too. You can also get the powder coated steel bread bin as part of a set with tea, coffee and sugar tins, which would make a lovely gift for a wedding or house warming. The focus of Garden Trading is to design and produce functional everyday accessories and lighting for the home and garden. Go and have a look they have so many high quality, stylish things you will want for your own home and garden or that would be perfect for gifts. 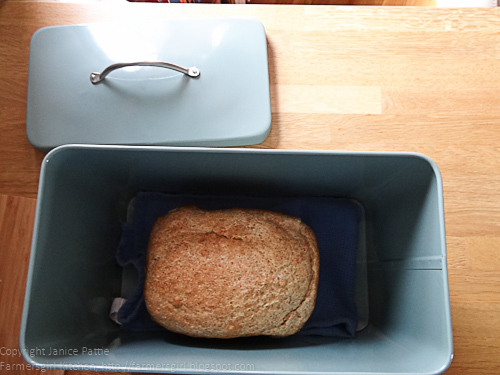 Many thanks to Sophie for the opportunity to review the Shutter Blue bread bin. I was not paid to write this review and all opinions are my own. Lucky you Janice! I have a few items in my home from Garden Trading and I enjoy all of them. I don't have that nice bread bin though! I need this bread bin in my kitchen NOW!